Fall is the Perfect Time for a Barn Wedding! 1. Wood. Seems obvious, right? 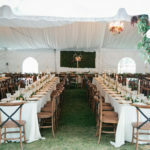 Most would expect the barn to be made of wood, but throughout your venue, you will be using wood elements not only in the obvious structure of the barn but in your decor as well. We recently saw a creative table centerpiece made from a three-inch thick cutting of a large tree trunk complete with the bark still in place. Atop the “slice” of trunk sat tall colored glass wine bottles with pops of brightly colored roses and candles. Quite romantic! 2. Candles. Another element that says “forever.” While candles were a primary source of evening light in the original days of barn use, today, candles provide not only a soft glow to light the table, but they also provide warmth to the atmosphere of your event. A flickering flame harkens a time long gone, a time when things were much less complicated. What better time to press the pause button and go back in time than a celebration of new love and a new life? 3. Fresh Wild Flowers. Once again thinking in a rustic theme, fresh wildflowers were one of the very few ways old timers had to decorate. Cutting some fresh flowers from out in the field and popping them into a bottle or mason jar on the table provided instant decor. Today’s arrangements are much more sophisticated and full of hybrids and exotic flowers, but by adding simple, fresh flowers that are not overly arranged, you will achieve a look that blends well with your rustic venue. Create a classic, theme wedding this fall with a barn wedding. With just a few simple elements of lasting style, you can create a rustic yet chic look that will have you and your guests swooning! Our passion and expertise are parties! Weddings, corporate receptions, family events, indoor or outdoor – we have it covered. At Colorado Party Rentals, we offer full-service event planning that will ease the planning stress and create lovely memories for that special day. Together, let’s create an exceptional romantic barn wedding that will be perfect for this fall!